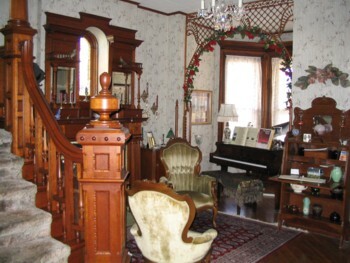 As you enter the foyer of the inn you are immediately surrounded by fantastic original woodwork, including one of two fireplaces trimmed in cherry. In the center of the chimney is a lovely stained glass window. Six generations of antiques are found throughout the inn. 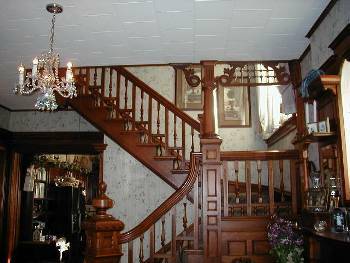 As you enter the Inn the first thing that catches your eye is the solid cherry staircase which leads to the 4 themed guest bedrooms, 2 bathrooms, kitchenette, and library/lounge on the second floor. 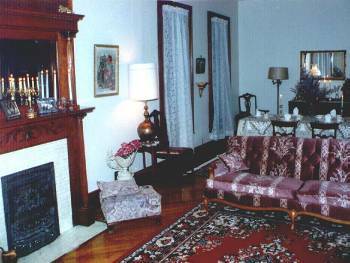 The second cherry trimmed fireplace is found in the sitting room area on the first floor. Immediately behind the sitting area is the dining area where breakfast is served. 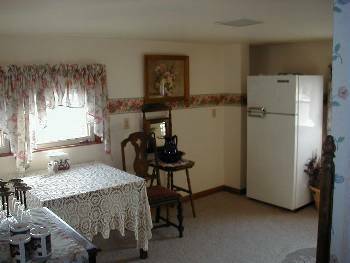 An upstairs kitchenette is provided for guests. This includes a refrigerator, microwave, glasses, mugs, table, chairs and games for your enjoyment. Home - Bedroom Photos - Rates, Policies, etc.